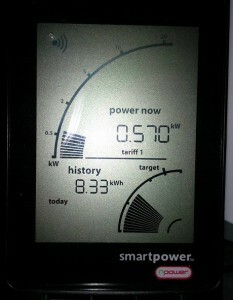 Three months ago we got a small gadget from our energy provider – a smart meter. I didn’t think of it much, but we’ve got it up and running and located it on the kitchen worktop right on top of the coffee maker. The coffee maker is broken anyway but it serves as a good stand and makes the new toy difficult to miss when going around the kitchen business. The meter itself is fairly simple, it shows the current energy consumption. It also lets you set a daily target for energy use. It then displays how you’re doing against your target today, how you’ve done yesterday and over the last week. Since now the information was there and available to us, we started looking. To my surprise the single most demanding consumer in the house turned out to be the kitchen lighting. Upon reflection, twelve 50W halogen lights turned on for at least a few hours every day do need a lot of energy. Now that the kW were flashing right in front of us we had a good incentive to change our habits and it proved very simple too. Just turn the light off when you leave the kitchen – a glance on the meter and you know why. Within a month we started saving energy. With the first wave of improvements were able to look further and decided to replace halogen bulbs with LED equivalents. Today, only three months later, we are using 40% less energy and this improvement was neither costly nor difficult and we can still do better, all thanks to a simple feedback mechanism from a useful gadget. The same principle applies to software development and works very well. Using information radiators, big prominent boards with relevant data, is invaluable in driving improvement efforts. It is also possibly the easiest way to initiate a change and is why Kanban proves so popular recently. So make the invisible – visible.